After a series of poor results, no one was expecting fnatic to dominate everyone on StarSeries i-League Season 7. So far, Swedes have only dropped two maps, that being against North in the quarter-finals and NiP in the opening match. In the group stage, fnatic stomped both NRG and Vitality. They have also edged out NiP over the course of three maps. In the playoffs, fnatic played on a really high level as they defeat North in a decider. NRG had nothing on the Swedes yet again. However, fnatic had to close this best-of-3 series in overtimes on both Cache and Overpass. Natus Vincere, however, was shocked in the opening match where they suffered a 2-1 defeat against ViCi. They bounced right back by beating NRG, BIG, and NiP to secure their playoffs spot. Even though both ENCE and Renegades brought it close in the playoffs, Natus Vincere was simply better. Let’s go over the map pool for this match. Since this is a best-of-5 series, we should have an easy time predicting map picks and bans. Firstly, fnatic is definitely banning Train again Natus Vincere. On the other hand, s1mple and co. do not play Cache and I can see them banning it first. When it comes to map selections, fnatic should definitely opt in for Mirage. On the other hand, either Dust 2 or Inferno should be go-to maps for Natus Vincere. As for the other maps, I would give an edge to fnatic on Nuke while Natus Vincere is definitely better on Overpass. In conclusion, both of these teams are playing on a high level so far in StarSeries i-League Season 7. From my perspective, Natus Vincere faced off against tougher opponents and they delivered. However, Fnatic did not shy away from stronger opposition either as they defeat Vitality, NiP, and NRG. Map pools are also very different for these teams, hence why I am expecting a decider in this one. You can clearly see that fnatic is clearly favored on two maps, which are Nuke and Mirage. On the other hand, Natus Vincere is definitely better on both Inferno and Dust 2. The reasoning should be really simple for this match since both fnatic and Na’Vi are capable of winning their map picks. 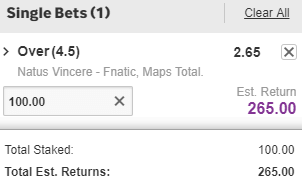 Even though betting on over 3.5 maps is a safer option, I am still confident that we are going to see a decider in this one. Odds are great and I have to take them.